“For a long time this idea was growing in my head and finally it came true. I wanted to find a system that allows you to create every possible and impossible geometric structure; a system based on simple components that allow for endless variations. In this three-day master class, we will start with simple structures. On Day 1 we will build one component to learn the basic technique. On Day 2 we will start making spheres consisting of two different components, and on Day 3 we will make a sphere consisting of three shapes. In addition, you will learn how to use these components in "normal" jewelry and learn ways in which to build many "bricks" to create your own designs and spheres. 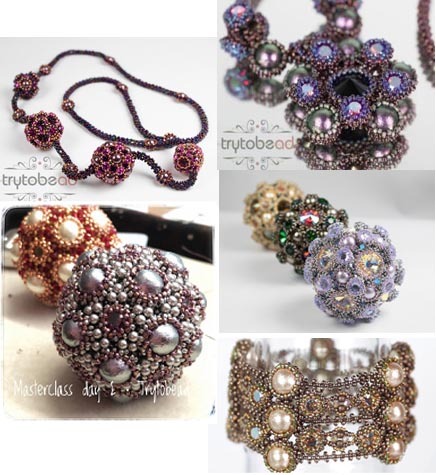 These photographs are examples of some spheres and how they can be used in jewelry." Requires knowledge of all off-loom bead weaving stitches.